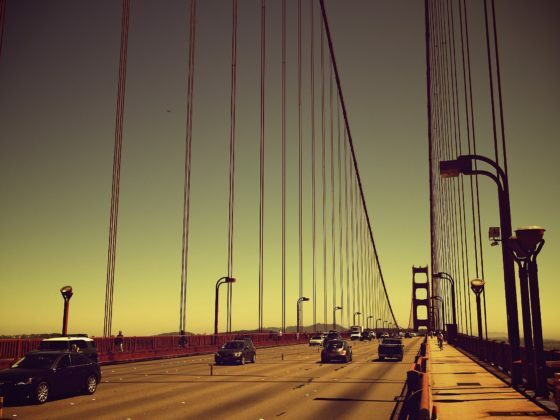 If you’re scared to drive or walk over bridges, you may have gephyrophobia — which is the fear of bridges phobia name. I used to have a similar phobia – acrophobia, which is the fear of heights. Now, I’m a bona fide roller coaster enthusiast. No kidding. I broke my fear of heights by taking baby steps. That’s how thousands of people with gephyrophobia tackle their complex fear of crossing bridges, as well. For the most part, when you have gephyrophobia, you must either face your fear on a daily basis or risk being confined to your own neighborhood. Gephyrophobiacs are also thought to have a higher-than-usual risk of panic attacks — which are relatively common occurrences for those who have phobias, such as a fear of bridges or heights, or similar anxieties. So here are some ideas to help you with the baby steps necessary to get past your fear of driving over bridges or walking across them. Many who have gephyrophobia will go out of their way to avoid crossing a bridge. Those who do try to cross a bridge will often experience high stress levels, and may even freeze up while driving on the bridge. That is an issue police officers who patrol the Lake Pontchartrain Causeway Bridge in Louisiana have reported. In many cases, those police officers have had to literally rescue the panic-stricken drivers and then chauffeur them across the bridge. Some bridges in the United States are so notorious for striking fear in motorists that local governments have arranged driving assistance programs for drivers who ask to be chauffeured across the bridges. Tappan Zee Bridge, New York City – The New York Thruway Authority allows drivers to call their department ahead to arrange for someone to drive them over the bridge. Chesapeake Bay Bridge, Maryland – The Maryland Transportation Authority has an arrangement through private companies to drive motorists over the Chesapeake Bay Bridge. Mackinac Bridge, Michigan – Members of the Mackinac Bridge Authority will, for no cost above the bridge’s toll, drive anxious motorists across this famous bridge. If you live near a major bridge (or plan to travel near one soon), see if there’s a driving assistance program already in place that you could utilize. People with gephyrophobia commonly overcome their anxiety just as I did my fear of heights – by taking baby steps. I, who as a child was scared to sit in the upper decks of the local civic center arena to watch the circus, now enjoy riding roller coasters regularly. And I once took a trip to the top of the Empire State Building in New York City! How did I get past the acrophobia? I began riding short water rides and wild mouse rollercoasters at the local theme park, eventually graduating to riding the taller thrill rides and larger roller coasters. If you have gephyrophobia, you may want to start by crossing short bridges or those that don’t rise very high off the water — such as causeways. Eventually longer, taller, famous bridges can be crossed as you become less anxious about driving or walking over bridges. Many gephyrophobiacs try to distract their minds while crossing over bridges by listening to music or playing games with themselves. Say a list of words that begin with a certain letter, such as “V” – vapor, violin, voyage, and so on. Listen to your favorite music and play it loudly enough that you focus more on the songs than you do on your fear of crossing bridges. Read license plate numbers on the cars that are ahead of you on the bridge, or the cars that pass as you’re walking on the bridge. Turn on talk radio and pick out certain words that have a common theme – perhaps words that all start with a certain letter, contain a certain number of syllables, or end with a particular letter. Whatever you do, be sure that you don’t distract yourself from the duties of driving your car or walking safely across the bridge! The goal is to replace your fear with simple mental games – not completely zone out. Those are some simple baby steps that you can take to get over a fear of driving over bridges or walking on them. If you need more help getting over your fear of bridges, you might want to seek the assistance of your doctor — who can recommend a specialist in your area that is trained in helping people learn how to overcome fear.